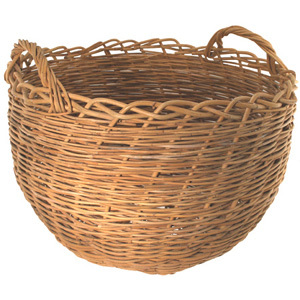 Bushel Basket Kit uses #4, 5 & 8 round reed. Great for hauling vegetables, or storing toys, kindling. Jumbo Bushel Size. 18" x 18"
SKILLS LEARNED: Indian base, twill weave with round reed, closed border, applied twisted handles are skills learned with Bushel basket kit.